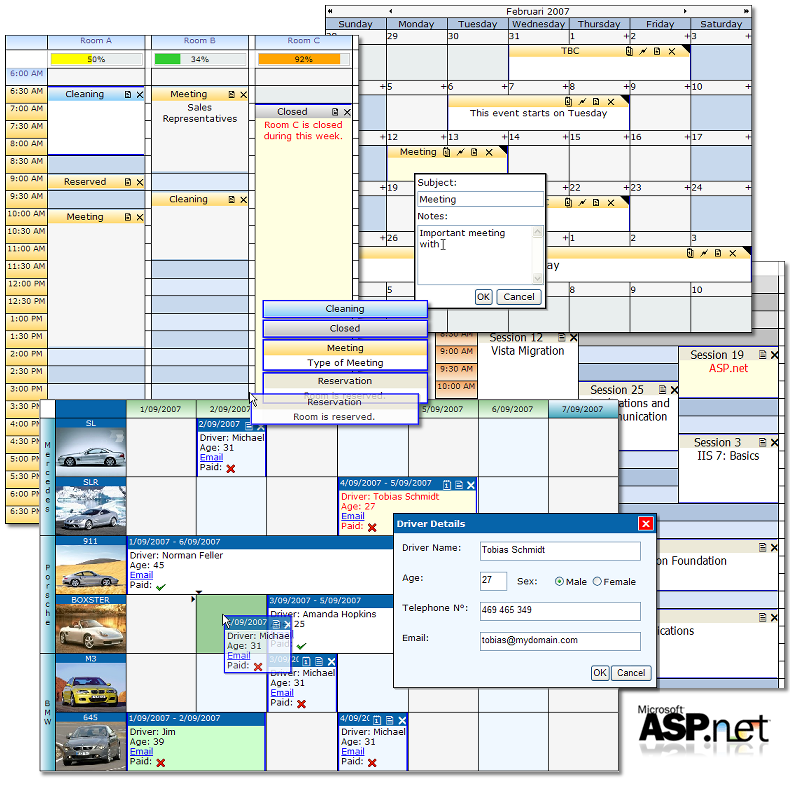 WebPlanner is a first-class ASP.NET control for implementing a broad range of planning and scheduling solutions. Whether a project requires the creation of a single-user Personal Information Management (PIM) application or time planning for multiple resources such as hotel rooms, rental cars, and university courses, the WebPlanner provides an open, highly-configurable interface that will suit the project's needs. Because WebPlanner is browser-based, it is perfect for applications supporting users connected via an intranet or the Internet. 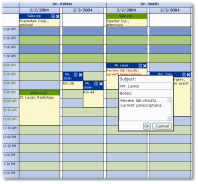 WebPlanner supports dynamic viewing of multiple resources and scheduled items in a variety of modes. Items can be scheduled at any granularity of time within a day view. Broader pictures of allocated resources and appointments can be had via the day period, month, multi-month, timeline, and week views. All of these modes are available through a single WebPlanner control placed on a web page. WebPlanner also includes a MonthPlanner control that displays events for an entire month in a fashion similar to a wall calendar. To easily handle unscheduled events, another component WaitList is included. 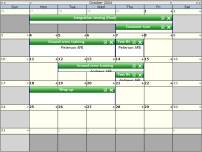 This component displays unscheduled events and allows to move these with drag & drop to the WebPlanner or MonthPlanner. Users find it easy to interact with WebPlanner. If a person needs to move a scheduled appointment from one time slot to another, or even from one day to another, they can do so by clicking on the appointment and dragging it to the desired time slot. If the duration of an appointment needs to be changed, the user can resize the appointment use one of the two track bars located at the top and bottom of the event. Simply connect WebPlanner / MonthPlanner with a DataSourceID with UPDATE, DELETE, INSERT commands specified and the WebPlanner is up and running. This makes using WebPlanner as easy as using the ASP.NET GridView. WebPlanner integrates well with an application's existing security framework and is perfectly suited for public and private web sites. For public consumption, the entire WebPlanner may be marked as read-only. For situations where the user is authenticated, the individual meetings and appointments may be configured as read-only or read-write based upon the user's privileges. For example, medical patients could schedule their own appointments using the Internet. The online meeting room example shows you how to implement a role-based security system. WebPlanner is used in a wide variety of situations and our users have found it to be quite pliable. We've tried to make the appearance and behavior of the WebPlanner and MonthPlanner controls as customizable as possible. For example, you can have WebPlanner invoke your own web forms when the user creates or edits an event (e.g., meeting, appointment). You can also control the appearance of each and every event, decide on a per event basis whether or not they can overlap or be double-booked, whether they can be resized, moved, or deleted. You can decide whether the time axis is displayed on the left, right, top, or bottom and specify the colors, interval, and format of the times. There are even more options available. Please try the demo version to see for yourself. WebPlanner is bandwidth friendly. We spent a lot of time reducing the amount of HTML the server controls deliver to the client browser. Many applications take advantage of User Controls for modularity or are based upon existing frameworks such as DotNetNuke. WebPlanner has been used successfully within DotNetNuke and other frameworks. It's use within User Controls is fully supported and fully functional. Fixed: issue with the WaitListEventDropped event ToBegin parameter when the SideBar.Position is set to Top. Through the WebPlanner Flexcel exporter, you can with a few lines of code export the WebPlanner to XLS, PDF, Image files without needing to have Excel or any other tools installed on your machine. The generated files can be directly streamed via the browser to the user.